When you come to Culebra from Puerto Rico you should spend the night in Old San Juan and visit El Yunque on the way to or from Culebra. You get to Culebra from Puerto Rico or the Virgin Islands by private boat, yacht, ferry from Ceiba to Culebra or local airlines. The Forum is a good place to check for Ferry Updates. Jeeps and big SUVs have pretty much replaced horses on the island, even though you can still see the odd rider going proudly through town. 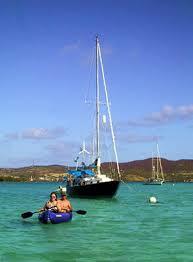 To get away from it all to those really remote places, a boat rental makes lot of sense. Most of the vehicles are in high demand during the holiday season. Even bicycles are hard to come by - so book them in advance! Or you can rent a car in San Juan and take it on the ferry; make sure you have a reservation and get there early! And check with your insurer, that you may do so! From the ferry to Playa Flamenco and the places in between there is a público service, which will cost you you between $1 and $2 or you can call a taxi, which are in effect the público vans :).